July 11, 2009 – Denver, CO . . . The common gesture of crowd members as they found their seats for the 2009 “Drums Along the Rockies” was to immediately look up at the sky. Half of it was that beautiful blue you only see at altitude in the Rockies, while the other half was filled with dark thunderheads that looked ready to open up. Many were glad they had brought a raincoat, but equally worried that they might need to use it. The winning unit turned out to be the Blue Devils with their musical book full of familiar tunes. A few raindrops started to fall as the event opened, but they were put out of mind as High Country Brass of Denver took the field for exhibition. This is Colorado’s first all-age drum and bugle corps. As an all-ager myself, I was delighted to see this 25-member corps play with obvious experience retained from their former marching days, as well as a touch of panache that had the crowd clapping by the last of their three numbers. While the rain continued to drizzle and hinted at a downpour to come, the next exhibition took to the field. This time it was two high school drum lines for the First Annual “Rocky Mountain Throwdown.” The event pits some of the finest percussionists from Colorado’s high school marching bands in face-to-face competition. It also continues to solidify the Blue Knights’ stature in the local drumming community that includes their four-time world champion winter percussion ensemble. The two drum lines that made it through preliminary rounds earlier in the day were Chaparral High from Parker and Legacy High from Broomfield. Each school performed two “throwdowns” on the 50-yard line, putting their all into a rapid-fire, energetic and controlled frenzy of drumming to outdo the other (Chaparral won). It was a fun, energizing new event at “Drums” — a wonderful addition to the pre-show entertainment that we’ll look forward to seeing again. The last exhibition was provided by Rocky Mountain Brass Works, a Denver-based, British-style brass band that also played the National Anthem. The rain so far had held off, with only the occasional sprinkle as the Cascades entered the field. The theme for the Seattle corps this year is “Beyond the Forest.” As the corps set up, members of the color guard carried branches of a tree. These were used effectively as props to convey the sense that the audience was looking into a forest and, with the associated visuals of greens and Earth tones, nicely evoked a forest setting. This was also reflected in the music through the use of rhythmic effects and a somewhat sedate and dreamy middle section in the repertoire. The color guard had a missed catch or two during the middle pieces, but found its footing by the end to mesh nicely with the corps for a strong finish to enthusiastic applause. The best thing about this show is its consistent tone and mood, which is carried out flawlessly from start to finish by a very talented Cascades corps. The Mandarins presented a somewhat more esoteric theme, “Absolute.” Again, the props they brought in were unique — pink and blue inflatable mattresses, another enigmatic clue to the performance we were about to experience. The crorps provided a solid performance, with fluid movement and coordination between the guard and the rest of the corps. The music was direct, forceful and well-executed, suggesting that the word “Absolute” described the confidence felt by the Mandarins on the field this year. Also, the guard members are clearly trained in dance at a very high level. The only part of the performance that did not quite work was the use of those mattresses. During the first movement of Beethoven’s “Ode to Joy,” the guard used these first as tumbling mats and then attempted to incorporate them into their dance moves. The overall effect, however, did not quite come together and seemed a bit out of place. The second movement of the same composition, titled “Absolute Rhythm Ode to Joy,” got things back on track with an excellent display of drum work, showing accuracy, speed and intensity. The closing was strong and left the audience ready for more. This corps has always excelled in developing shows that its members can perform cleanly and tonight this skill was on full display. The Troopers are so well-loved in this part of the country that the buzz of excitement began as they entered the field. Their theme for the evening was “Western Side Story,” which had them take up random-looking positions, with individuals and groups of members interacting in various ways with each other. Perhaps it was just their uniforms, but it looked as if we were viewing a military camp. From this seemingly random staging, the Troopers moved rapidly into a tight formation for the opening. The playing was solid and well-executed, with selections from Leonard Bernstein and Aaron Copland that are firmly fixed on the American psyche. The crowd was soon fully engaged with the musical performance and the tight coordination between the color guard (in surprisingly effective Pocahontas costumes) and corps, and they showed it with loud hoots of joy, clapping and appreciative foot-stomping. It was hard not to get carried away and I must admit that this was one of the finest performances from the Troopers that I have ever seen. The show takes an approach to the familiar musical themes of “West Side Story” that is subtle and very sophisticated, terms that one rarely uses when describing this corps. They have taken a big step back to prominence this year and it will no doubt pay off well in Indianapolis. The crowd was clearly warmed up and ready for more as the Colts performed their repertoire, “Fathoms.” With selections such as “Song of the High Seas” and “The Voyage,” it was clear we were in for a maritime adventure as the sound of waves filled the stadium. The sea theme was emphasized by the color guard with flowing movements and undulating wave patterns. The audience gave a strong reaction as large, oversized silks representing ship’s sails were carried through the field. The playing was strong and well-executed throughout, though there were no real moments at which the performance moved into new, uncharted areas. While this was a fairly predictable theme with strong, but not amazing, performances, the audience enjoyed it and showed their appreciation with a standing ovation. The Madison Scouts provided the final performance before intermission. Their theme, “Relampago,” was another that fell into the category of esoteric. Although I wasn’t aware of it at the time, Relampago is a comic-book superhero (and the first Mexican-American superhero in American comics). 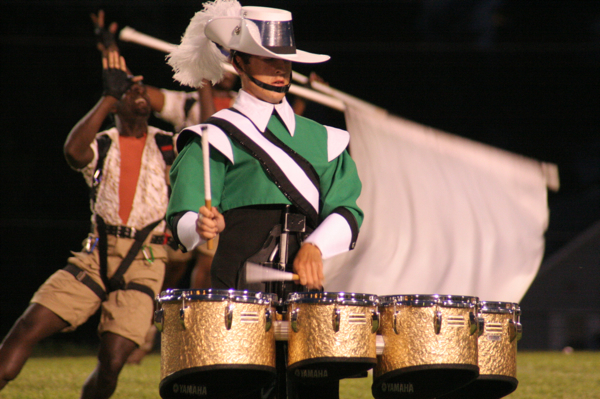 This theme was represented both in the music, with original works such as “Relampago’s Triumphant Return,” as well as the costumes of the color guard whose shirts evoked the superhero theme. One of the nice bits to watch for is a short but powerful snippet of “Malaga.” As with the Colts, the musical performance was well-executed and solid, though they failed to cross into any groundbreaking areas. The color guard was equally entertaining and demonstrated acrobatics that added Madison-like flair to the performance. Overall, the Madison Scouts put on an energetic and highly entertaining show to close out the first half of the evening. Following intermission, it was up to the Santa Clara Vanguard to re-energize the crowd with their repertoire, “Ballet for Martha,” written by Aaron Copland at the request of choreographer Martha Graham, who used this distinctly American music to create the ballet “Appalachian Spring.” The Copland piece makes up the entire Vanguard repertoire. As the performance began, it soon became clear that we had gone up a notch, with beautifully-executed maneuvers, intricate percussion work, strong clear notes from the brass and perfectly meshed music from the pit. The corps’ movements, playing and execution evoked the optimistic themes in Copland’s ballet and provided a wonderful opportunity to showcase the talents of the corps. The audience was swept away with the performance and, at one point, gave a standing ovation before the performance was over as the Vanguard formed two lines and marched toward the crowd with ever-increasing volume and intensity. Finally, the audience was brought to a second standing ovation at the end of this very moving show. The Bluecoats’ theme, “Imagine,” starts with the John Lennon song of the same name and includes titles such as “Children’s Hour of Dream” and “Hunting Wabbits 2,” which suggests the playful repertoire to come. The corps cut an impressive sight on the field, with points of light reflecting off of their uniforms and blue and silver accents dominating. The musical and color guard performances were very strong and the audience particularly enjoyed the flag tosses across distances on the field. The musical arrangements, however, to me did not display the talents of the Bluecoats very well during most of the repertoire and even Lennon’s iconic “Imagine” was difficult to recognize and did not seem to coalesce into anything meaningful. Things came together at the end, however, as the corps broke into a jazzy, swing version of “Haitian Fight Song” for their final piece. This really showcased their skills with a big band, jazz style and, while we got a taste of what the Bluecoats could do, it was, unfortunately, not enough of a good thing and left me wishing we had had more. Next up were The Cavaliers with “The Great Divide.” I’m sure this theme resonated with the Coloradans in the audience and it was reinforced as the corps formed two distinct groups on opposite sides of the field to start the show. The color guard matched the theme with outfits reminiscent of explorers/mountain climbers and held ropes tied to other corps members. As they executed maneuvers, the color guard moves and guides them by “pulling” on the ropes. This deft choreography was matched by superb playing from all sections of the corps, which played to the back side of the field, giving the impression that the stadium was actually a canyon. Cries of “avalanche!” and “is anybody in there?” reinforced the effect. By the end of their set, The Cavaliers had guided the audience through a outdoor adventure creatively painted with music and athletic choreography. The audience’s appreciation demonstrated how thrilling this show is — an excellent example of brilliant show design that communicates the intended theme with power and effectiveness. The Blue Devils took the penultimate performance position with their show titled, simply, “1930.” The corps entered carrying white folding chairs, with the color guard dressed in bright yellow outfits. The musical selections included recognizable and crowd-pleasing classics such as “I Got Rhythm” and “Happy Days Are Here Again,” as well as pieces from Copland and Gershwin, all of which meshed nicely within the 1930s theme. The marching and playing was absolutely top-notch and coordinated perfectly with the movements of the color guard. As for the chairs, they were frequently moved and configured into different patterns, culminating in the figures 1, 9, 3 and 0 across the field. The effect was one of seemingly-disorganized movement that came together rapidly into instant organization with sharp focus, both visually and musically. Of all the corps that played tonight, the Blue Devils had the most moments of near-perfection in which all elements came together to produce a stunning aural and visual effect. Similarly, the repertoire was both complex and recognizable to the audience, with spot-on arrangements of classic pieces that made them sound fresh, exciting and perfectly in the mode for a 1930s show with a modern edge. Finally, the host corps, sponsors of the 2009 “Drums Along the Rockies” and the local favorites, the Blue Knights, took the field for the final performance of the evening. The theme this year is “Shiver” and opens with “Winter” from Vivaldi’s “Four Seasons.” To all Blue Knights fans out there, this show represents a new direction –something not as “dark” (musically or thematically) as in previous years. The feeling is reinforced as the snow-white uniformed color guard walks on, giving an immediate impression of snow and lightness. In essence, the Blue Knights set the stage for this change in direction while walking onto the field and I was immediately taken in by their visual presence. I wasn’t disappointed by the music, either. The arrangements fit the mood as the corps and the color guard collaborated to create rolling snowballs and avalanches through complex and creative formations (again, this plays well to the outdoors/skiing Colorado crowd). BK had ample opportunity to demonstrate its skilled drumming as well as its accomplished musicianship in all areas. In short, this was perhaps the best Blue Knights performance ever. Something has changed with the Blue Knights that is hard to put my finger on. Is it the arrangements, the music, the visual effects? I think it’s all three and something more. I like this direction and look forward to more exciting performances from the Blue Knights. Posted by DCP Publisher on Wednesday, July 29th, 2009. Filed under DCW On-Line.